Q. How do I benefit from using the your service? Our team has been assisting distressed homeowners for over 6 years and is skilled at working with your lender(s) regarding a short sale for your property. You get to live in the property while negotiations are going on and this is typically 3-12 months. We (Midwest Real Estate Solutions and Olivia Homes) work along side the top shortsale negotiators in the area and focus on the expedient liquidation of your property. This combination provides you with a high quality, professional solution that is focused on getting your home sold. Q. How does this improve my chances of avoiding a foreclosure? An actual proactive plan is put in motion vs. a Realtor flying solo with no plan and probably no track record of success. Q. What if I dont use Midwest Real Estate Solutions and Olivia Homes for my short sale? There are too many important contributions/tasks/events that need to occur properly for your home to actually get sold. Chances are, you will be entrusting novices to successfully accomplish them. Q. How will I know how my short sale is progressing? Our activities are updated frequently and we will share the progress with you on a regular basis. Q. Can you guarantee the sale of my home? No, unfortunately we cant. As we have shared, there are far too many factors that neither we nor the legal team can control that contribute to a successful short sale. However it wont be for a lack of a plan or effort. Q. Who pays Realtor commissions & closing costs if I sell for less than what is owed? All commissions and closing costs will be paid by your lender. Q. What is my role in the short sale process? Maintain your property and be cooperative with any information needed by our negotiator and listing agent. We need all of us pulling in the same direction to maximize our chances for success. Q. What if no one purchases my property? What this really means is that we haven’t found the correct price needed to get offers. We will attempt to get your auction date moved back and we will continue to collect market data that can be re-submitted to the lender in the hopes that they will reconsider our market pricing information. We really don’t care how long this may take. In short, we will fight on! Q. 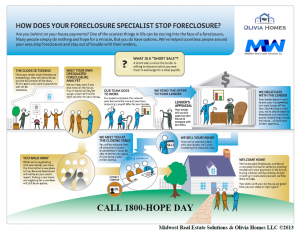 Who is Midwest Real Estate Solutions and Olivia Homes? We are a real estate solutions company, specializing in short sales. Q. 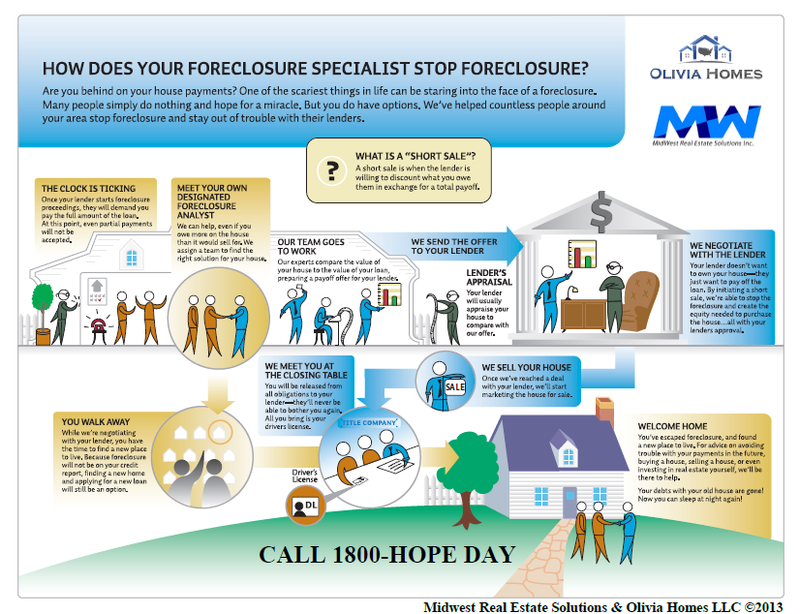 What is Midwest Real Estate Solutions and Olivia Homes role in my short sale? Management of the entire short sale process. We locate the proper listing agent. We set-up the spiral price plan and monitor the agent to ensure that it is correctly being followed. We also sign a contract to purchase your home which allows us to immediately begin the short sale process. Additionally we have the ability to market your property to large pools of real estate investors for possible purchase. Q. What happens when additional offers come in? Your agent has been instructed to inform these potential buyers that a property management company (us) has presented an offer that is in the process of being reviewed by your lender. Once your lender responds with an approval, all potential buyers will be advised of the final, negotiated price. Any of those buyers can elect to purchase your property for that lender approved price.